Home » Quarter Final 4 – Who was eliminated from MKR tonight? It is quarter final 4 on MKR tonight and someone will be eliminated, the last challenge before the semi-final who’ll be eliminated tonight? In round 1, the contestants have 90 minutes to cook a three course dish and the judges will taste the dishes as soon as they are finished. David & Betty are first to get their entree out. The judges love it, Manu says it is spicy, sweet and salty broth, it is delicious. Next is Amy & Tyson’s entree. The skin is crispy, the chicken was delicate. Manu loves it. Pete says its a strong start for Amy & Tyson. Amy & Tyson are almost done with their main before the other teams have even finished their entree. They plate it up and take it to the judges. Pete loves the presentation, as does Manu. They love it. David & Betty get their entree out, Manu loves it, it has the perfect amount of heat, Manu says they are “killing it”. The next entree to go out is Tim & Kyle’s squid. Manu says he is disappointed, after 50 minutes the plate doesn’t look appetising. Pete doesn’t like the sauce “whatsoever”, Manu says they didn’t use their advantage well at all. The last two entrees to go out are Mark & Chris’s and Valerie & Courtney’s. They both start plating up at the same time. Mark & Chris get their entree first. Manu says “it’s nice” but it is missing something crunchy in the rice paper role. Valerie & Courtney’s dish “looks really good” and Manu says it was worth the wait. The salmon is cooked perfectly but it is lacking seasoning. It is not Pete’s favourite entree. Tim & Kyle get their steak main on. It is nice and tender but Manu is not sure about dish. The next main to get out is Valerie & Courtney’s Chicken Biriyani. It “looks beautiful”. Manu says he was waiting a long time but it is delicious. The first dessert it up, it is Amy & Tyson’s. The judges like it, they say by the dishes served, Amy & Tyson really want to be in the final. Finally Mark & Chris get their main up, its presented well but the dish is a bit dry. The remaining contestants only have 7 minutes to get their desserts out. Tim & Kyle get their dessert up, followed by David & Betty. Tim & Kyles presentation is good, “it makes the most sense”. The pana cotta was good. David & Betty’s dish is “nice and fresh” but the kaffir lime flavour doesn’t go. There are two teams still needing to plate up, Valerie & Courtney and Mark & Chris, but they only have minutes to spare. They both get their dishes up with 3 seconds to spare. Mark & Chris’s pina colada is tasted first. Pete doesn’t mind the flavour composition, its “not a bad dessert”. Valerie & Courtney’s Mango Kheer is undercooked, the warm mango doesn’t really feel good on the palette. Round 1 has come to and end. The team with the best 3 course meal and through to the semi final was Amy & Tyson. Their reward for coming first, they get to choose who they want to cook against in the semi final. The second safe team is David & Betty. Valerie & Courtney are also safe, this means that Mark & Chris is cooking off against Tim & Kyle. Mark & Chris are cooking off against Tim & Kyle. Mark & Chris are making Beef Rib Chilli with Charred Corn and Guacamole. Both team’s dishes look good. Who will be eliminated from My Kitchen Rules tonight? Here are the latest scores. First dish to be tasted is Mark & Chris’ Beef Rib Chilli. Pete asks if they are happy with the spice level and the textures. Tim & Kyle’s dish is taken to the judges. Manu asks if they’ve cooked better dishes in the competition, they aren’t giving anything away. They send the contestants to the back room while they deliberate over the dishes. Tim & Kyle’s dish is reviewed. Pete says the beef cheeks were cooked beautiful, and the cauliflower was tasty. Manu says it is a “pretty good dish”. Mark & Chris’s dish is next. Manu says the ribs were “quite fabulous”, the jus was very rich but the polenta missed the mark. The guacamole shouldn’t have been blitzed, there was not enough texture. Pete enjoyed the dish, the beef was nice and spicy, but there was no texture to take the dish away from the mushy textures of the main elements. Amy & Tyson vs David & Betty and Tim & Kyle vs Valerie & Courtney. 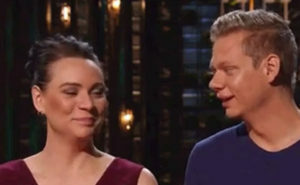 ← Quarter Final 3 – Who was eliminated from MKR tonight?